AME (Applied Micro Electronics) is an independent developer and producer of high-quality electronic modules and products. The Eindhoven-based firm has 240 staff, most of whom work in product and process development. The focus is on three core technologies: power conversion, the internet of things and sensors and actuators, with the corresponding highly automated production facilities. 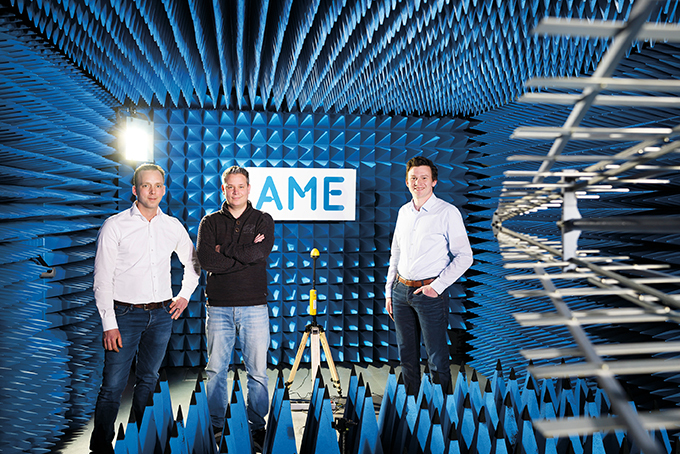 AME has been developing IoT solutions for over a decade, ever since the day it was still called telemetry (sending data over telephone lines) or machine-to-machine communication. Electronics with RF technology (radiofrequency) handle the communication, mostly wireless using Wi-Fi or Bluetooth. This is used to collect data from, for example, sensors for the purpose of production control and monitoring in plants, but also for climate control at home. The big data is analysed and clarified on servers (cloud) that are stationed at AME but which may also be installed and maintained on a client’s site. AME is concerned with the success of the product and therefore the firm also supplies the associated apps and web applications for a wide range of IoT applications. AME already has over 100,000 connected devices and Van Wijlen expects that number to grow exponentially in the coming years. Besides the further standardisation of the various hardware and software components – designed to allow quick configuration of application-specific IoT solutions – there are plenty of other challenges left, such as the following questions: What can you do with all that data? What conclusions do you draw? And which actions do you subsequently run? The algorithms used for this purpose are already self-learning: they adjust themselves based on the data processed. However, the ideal picture of big data – analysing it using artificial intelligence and running actions on the basis thereof – is still rarely seen in practice, says Van Wijlen. ‘That is first and foremost a limitation from the market, which is only just beginning with it. There is also still a lot of work to be done on data analysis itself. The added value of IoT can be raised significantly. The detection of anomalies, for example, can help predict whether a device is about to break down; indications include energy consumption or temperature that is significantly higher than the average in the installed base. AME has dedicated data scientists for this, but an important role is cut out for the customer, who brings in their domain knowledge and ultimately wants to be able to program those smart algorithms themselves.